Today is my last post. I have had a lot of fun watching these films and writing about them and I hope you all have enjoyed hearing my thoughts and opinions. The film I chose for today is one of my favorites. It's a musical and, it might even be my favorite musical. I always go back and forth on musicals because I think my taste in them is really dependent upon my mood at the time. Jesus Christ Superstar was released in 1973 and is based on the musical stage play of the same name. Music by Andrew Llyod Webber, lyrics by Tim Rice. I love the music in this film. I've always been really picky about the soundtrack of a musical. If I like the film version, I usually don't like the stage version. I guess that's because I'm usually exposed to the film version first and it's what I base my rating system off of. I do enjoy seeing the stage versions of the stories though, seeing a live presentation of the story and music I enjoy so much. I just don't want their soundtracks. I do have to admit though that I've never seen a stage production of Jesus Christ Superstar. I took a class on musicals at USC this last semester and we learned about the history of the film musical and the transformations it has undergone. We very briefly spoke abut this film. My professor used it as an example of the genre adapting to changing practices of the industry. After the studio breakup and the breakdown of the star system, musicals lost a lot of funding because they were so expensive to produce. The costumes and sets alone could cost the same as two sets of costumes and sets for two dramatic films. Musicals were all about spectacle, which meant they needed a lot of people and a lot of colorful props and fixings. So, once the studios broke up, musicals weren't affordable any more and it was hard to find a producer who would back such a risky investment. The musical genre had other issues to deal with as well, such as on location films. Musicals couldn't be easily moved from the soundstage to an actual location because of things mentioned before. However, some tried because that's what audiences wanted to see. 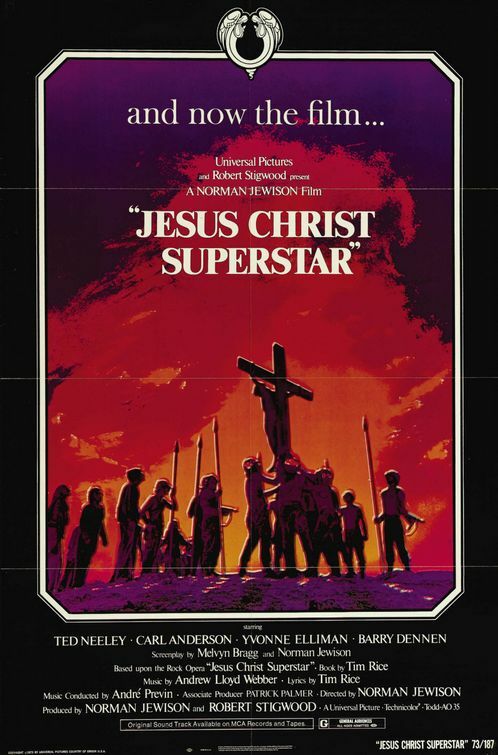 So, Jesus Christ Superstar is an example of a "runaway production." it's a film that takes its cast and crew out of the studio, and even country, to go to a location and film there. It was filmed in Beit Guvrin, Israel. It takes everything on location. This is done for many reasons. It helps compete against other genres that can show widescreen landscapes and, it's cheaper to shoot outside the US. So this film adapted to the times it was in. I like that I was able to take a class that talked about some of my favorite films and teach me new things about them. But back to the film and why I love it. I'm not sure exactly what makes it so enjoyable for me. I love the music, the stylization and the atmosphere of the whole thing. I think its imagery is indicative of the time it was made in, and I don't think that's bad. The tanks and airplanes are war symbols and war and protest were prevalent during this time. Even the "den of thieves" scene was indicative of the time period. The items for sale date the film a little and I wonder what a modern version would have instead of some of the items seen in the film. Perhaps cell phones and iPods would be items for sale in a modern "den of thieves" but I still think guns, other weaponry and drugs would also still be there. I know a lot of people love it and a lot hate it. Some people don't like what it says religiously, others hate the rock opera aspect of it. For me, both these things make it a movie I never get tire of year after year. Also, I just have to say I think this is actually a pretty cool trailer. Love the movie. Have seen the stage production several times, once with your mom and dad. Next time it comes to town it's me and you. It's wonderful and you will love it. Have enjoyed your postings this week and our Blockbuster queue has some new additions thanks to you.